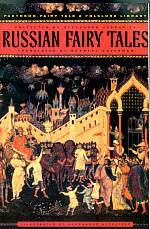 Collection of more than 175 fairy tales, in 661 pages, compiled by Russian ethnographer Aleksandr Afanas'ev (1826-1871). There are a number of black and white illustrations throughout by Alexander Alexeieff. "A beautiful book. I recommend it to all readers, young and old, who are interested in the folktale and its unique qualities" - Isaac Bashevis Singer, The New York Times Book Review. Some of the more common fairy tales include: The Frog Princess; Baba Yaga; Elena the Wise; Prince Ivan, the Firebird and the Gray Wolf; Ilya Muromets and the Dragon; Maria Morevna; Koshchej the Deathless; Vasilisa the Beautiful; and many others!